An open house is a scheduled time period when a home that’s available for sale is open to the public for viewing by potential buyers. Hosting an effective open house requires knowing when and how to show it, how to stage it, and how to engage with the attendees to maximize the chances of a sale. Part of hosting an open house is offering printing material for attendees to walk around with to learn more about the home. 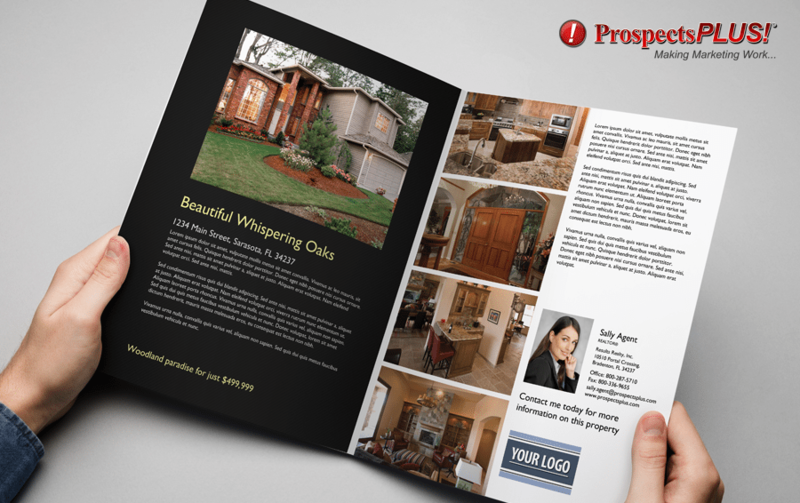 Consider using ProspectsPLUS!, a one-stop online design and printing platform, to create property brochures for your next open house. ProspectsPLUS! will design, print, and ship your brochures to you by the next business day so you can market to potential buyers without extra design costs or printing efforts. Click here to get started. The standard date and time for holding an open house is on a Sunday afternoon, because potential buyers generally have the most free time available. Holding an open house on a Sunday afternoon may be the tradition, but don’t be afraid to explore other dates and unconventional time slots depending on your population. Always advertise these open houses with a greater emphasis on the nontraditional dates and times. Potential buyers often expect Sundays as part of the package, so be sure to emphasize the area that might differ a bit for them. Hosting a successful open house sometimes means giving a more traditional public what they expect. In most communities, hosting an open house on Sunday is likely the best day to capture your potential buyer. Young families often have events on Saturdays that prevent their attendance, and Sundays can capture those after their time of worship or on a true day off from planned events. While some realtors will schedule for a bit later on Sunday (perhaps 3-5 rather than 1-3) to capture buyers viewing many properties on the hunt, the weekend tends to work best for most communities. There are definitely markets that are well served by showing homes on nontraditional days or at nontraditional times. If you are servicing a town with individuals who may not be in town for the weekend, for example, many individuals might truly appreciate attending an open house on a weeknight. Communities with large populations of those who are retired or work untraditional jobs can benefit from showing at untraditional times. While not the standard Sunday afternoon open house, you may end up being surprised by how many individuals you capture with a different approach. Hosting an open house on holidays can be controversial but effective. Homeowners often do not like opening up their home during a season that they would like to be spending with their family, but in vacation communities, this may be your prime showcasing opportunity. Homes are often decorated for the season, returning holiday visitors may be ready to make the plunge, and a home that is staged and ready for view has a solid chance to capture these potential buyers. If you want to host a successful open house as a realtor, you have to create an environment that will appeal to the greatest amount of potential buyers. New realtors are often uncertain about how to proceed with staging the home for an open house, but continue to think of your specific buyers and what will appeal to them the most. There are so many ways to show buyers the potential of the property, even if the house is currently vacant. Staging is instrumental for maximum impact. Staging your home can include such things as making visible repairs, cleaning and emptying rooms and closets, repainting in neutral colors, and generally making the home as impersonal as possible. Many agents will show a vacant home, believing the only alternative is furniture rental, which can be costly and time-consuming to arrange. While staging companies and furniture rentals have their place in hosting a successful open house, many times you can get the benefits to staging without the hassle with virtual services. If you have an empty home, show buyers its possibilities before they even arrive with virtual staging and have your iPad on hand for those who may not have seen the images prior to attending. If you have a home that the sellers have not yet vacated but are willing to use what they have tastefully, feel free to guide them in how to best rearrange, declutter, depersonalize, and organize for optimum impact. Effective home staging not only showcases the property, but allows the people who enter your open house to envision themselves in the life that this specific home can provide. When potential buyers feel connected to a home, they bring stronger offers that will help get your clients the best possible price. If you need a resource to get you started, feel free to use the tips suggested in our guide to Home Staging in 10 Steps. A brochure gives prospective buyers something to remember the property with. Make the most of the opportunity by including important information such as the property’s address, the listing price, highlight any key features, and include as many clear professional photos as possible. Despite the ability smartphones have to take photographs, potential buyers often browse homes without cataloging important facts about them. Hosting a successful open house as a realtor helps them remember the wonderful property they just toured and gives them information to help make a future decision. As an agent, Photoshop editing skills may not be your forte, but the importance of a solid brochure cannot be underestimated. Products like ProspectsPlus allow you to design a tri-fold brochure using a template that is professional and doesn’t require high caliber editing skills. There are two primary benefits to offering impactful brochures at your open house. It is not uncommon for potential buyers to attend a number of open houses in one day, with homes that contain many similar and overlapping features. Having a brochure that contains the best images and features of that home will help make the home stand out at a time when all of the others begin to blend together. Creating an outstanding brochure can help sell the home long after the open house has ended. Not all individuals who attend an open house will take a business card, but most will take a brochure. Creating an outstanding brochure gives you the opportunity to get your contact information into the hands of active potential buyers who are in the market right now. Even if all of your brochures result in acquiring only one new client, it has been well worth the time and effort. If you aren’t sure where to start, here are the Top 29 Real Estate Brochure Templates to impress your clients. Most open houses are advertised using signs in the neighborhood, but other effective tactics can include free options like social media to reach a highly targeted audience who will be most interested and most likely to talk to others about the upcoming event. We may live in a digital age, but the trustworthy traditional sign is still a staple of hosting a successful open house for realtors. People driving and walking in the neighborhood are some of your best advertisers. Whether planning to attend themselves or talking to others about the upcoming home for sale in the area, you want the locals to be well in the know. There are an amazing array of ways to use signs for advertising and the types of signs available for realtors are endless. To see tips on where to place signs to drive traffic to your open house or what types of signs are best to use, our guide to open house signs is extensive. If you’re already using social media, and you should be, then you’re already developing networks of people who are potential buyers. Having an active social media presence is essential for successful realtors. 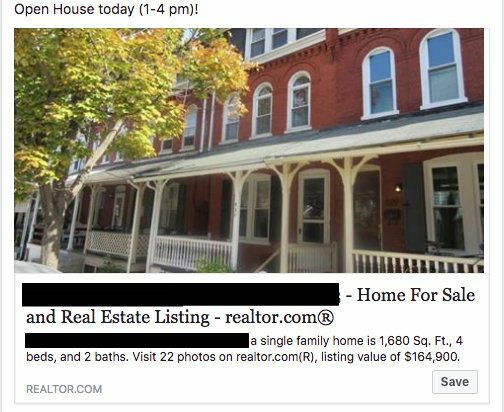 When any realtor wants to host a successful open house, social media should be the very first place it’s posted. How did I find my own realtor when moving to a new state? Instagram. Neighborhood Facebook groups are a wonderful way to freely advertise your open house to people who already love the area and may have friends or family looking to move in. By making a quick post to the neighborhood group, you get incredibly targeted word of mouth advertising absolutely free. Be sure to subscribe to neighborhood Facebook groups where people are often actively searching for houses and apartments in your area. 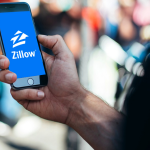 While you are advertising on social media, Zillow Premier Agent allows you to be listed as the exclusive agent on the property and increases your odds of getting the full commission. It’s also one of the most popular real estate platforms, so it’s where your potential buyers may be looking first. Imagine what it would be like to walk into your ideal home and create that environment. Hosting a successful open house for realtors involves putting yourself in the shoes of the potential buyer. Think about creating a welcoming first impression, and a great tip I use is remembering to consider each of the five senses: sight, sound, smell, taste, and touch. What will be the first thing a potential buyer sees when they walk in the door? Turn on that gas fireplace, set the table, have the home be spotless. A welcoming visual is one that appears clean, comfortable, beautiful, and relaxing. Homes are not always in optimal locations. Traffic right outside the door or a dog barking across the street will make potential buyers rethink the purchase no matter how beautiful the interior. A realtor hosting a successful open house will be one step ahead of potential problems. Sometimes soft relaxing music can mask the faint car noises in the background or make the dog in the distance blend into the background seeming not as bad as it would otherwise be. Realtors who want to host a successful open house toe a very fine line in the area of smell. While a home that smells badly should likely not have open public viewings, putting false scents into the air can be bad for those with allergies and make potential buyers feel that something is being hidden. Creating a welcoming environment can be as simple as boiling some spiced apple cider to serve on the stove during the Fall season or simply heating up appetizers in the home oven. Make any scent seem as though it is a genuine extension of the open house experience. When people are happy, those positive feelings help color their impressions of the home itself. Handing out appetizers, a special drink, or small treats as potential buyers tour a property can give your impressions a boost. From a tower of mini cupcakes to cookies from a local bakery around the corner (which they would have access to if they lived there), treats can help accentuate the positives of both the home and the neighborhood when realtors want to host a successful open house. When hosting a successful house as a realtor, as odd as it can initially seem, you want to think about even the experience of what standing in the home will feel like. Have a proper temperature set for the climate about 30 minutes in advance of guests arriving so that everyone is comfortable. Experiencing the home as “drafty” in a cold climate or “stuffy” in a warm one can make potential buyers believe the house is not well suited for their needs or would require additional work to accommodate them. The element of touch can be a surprising show stopper. For example, if showcasing even the smallest condo on the water, open a few windows and allow the breeze of the beach on a warm summer day to brush over them as they walk throughout. Hosting a successful open house for realtors is not simply about that very house, but about the leads you will capture and the people you will meet. Make the most of your open house by following these tips. Greet each person happily, and genuinely inquire about what they are looking for in their future home. Even if this property might not be the right fit for them, you might know a perfect house that they would fall in love with. Obviously, always ask potential buyers if they are working with another realtor. Getting feedback on the property is an important part of hosting a successful open house for realtors because it allows you to have a sense of what potential buyers are seeing and what may require some adjustments. Make a special note of elements that seem to be of general consensus or common questions that tend to arise, such as unclear property lines or a price point set a bit too high. Listen to what potential buyers have to say and inquire further into their concerns. If the house is not sold quickly, these things may be good feedback for the seller to address and help the property move faster. Individuals attend open houses for various reasons, many which are not about the home offered for sale. Often individuals who are very early in their home search process will attend open houses to get an idea of what they like or what certain price points can offer them. Even flippers sometimes attend open houses in the area looking at the finishes expected to try to match their own renovations to fit the market. Establishing relationships with individuals like this can be a wonderful help to your business as well as theirs. While you certainly want to capitalize on any leads by contacting parties that seemed interested during the open house, don’t forget that there are likely many other individuals who attended that might be interested in the services you have to offer as well. Organizing an open house as a realtor is a multistage process with many moving parts, so having an open house checklist can assure that everything gets done. Hosting a successful open house requires solid organization and planning that involves homeowners as well. In this section, we’ll offer a free open checklist and tips for using that checklist effectively. The first thing to do is download our free open house checklist to get organized. In the document, we help to get you prepared by dividing the checklist into three sections: the planning stage, one week prior, and the day of the open house. We’ll review these three stages and how to best use your checklist. In the planning stage of your open house, there is a great emphasis on getting homeowners on board to create the best possible version of the home for showing. Depending on the amount of work required to get the home ready for open house, this stage may begin weeks prior to the actual open house after listing. Hopefully, homeowners are on board and willing to do some work to get their home ready for showing. The planning stage is the time to recruit homeowners as active participants in preparing their home for the open house to increase the value and appeal of their home. While we offer 25 curb appeal ideas that have great ROI, many homes hitting the market might require a bit more. This sometimes requires hard conversations and honest discussion on what makes homes sell, without criticizing the homeowners taste or the condition of the home they may love and live in daily. The red dining room? Paint it neutral. The room stuffed with grandma’s old furniture? Put at least half in storage. The smelly cat litter box you noticed immediately upon entry? Address it. It is really important in this stage to be helping the homeowner to see repairing and changing some elements of the home as a smart business decision meant to get maximum value. Talk with them honestly about the expectations of an open house, and give them resources to help them complete the work. A place like HomeAdvisor can help them get work done at reasonable rates from locally sourced individuals who have good reviews. Feel free to give your homeowners a copy of the open house checklist so that they can look through advised changes, repairs, and expectations. Be sure to review with them the expectations of open house days, and have them be your partners in the process. One week before the event, your open house checklist will remind you to start tying up loose ends. At the beginning of this period, you’ll be confirming with homeowners that the open house schedule is accurate, that any repairs or changes have been done, that there are accommodations in place for any pets, and this is when the work on the realtor side truly begins. Getting a home prepared for showing takes a lot of preparation. Mark the open house on the MLS, and begin advertising. Using Facebook to target locally through neighborhood groups, forums, or ads can be a great strategy to gain local interest – but don’t forget the basics. Be sure to have your open house signs together and start putting out your riders. We reviewed the best real estate signs, and found differences in price and quality between vendors so be sure if you’re in the market, you choose one that best reflects your brand. This is also the time to get your materials together, and gather them. 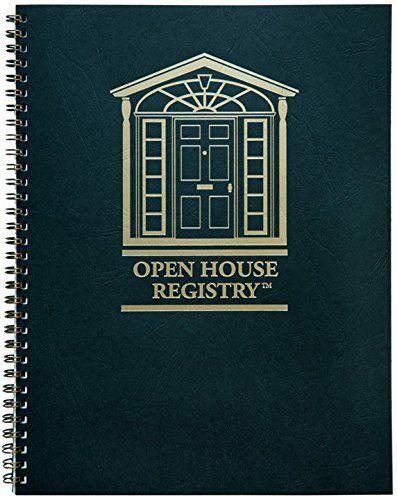 Print out open house sign-in sheets from our free templates, be sure that brochures are put together on the home with professional products like ProspectsPlus, and have home information potential buyers could be asking about such as utility expenses, property tax costs, or HOA fees. Other information like seller disclosures, neighborhood amenities, and purchasing agreements are great to keep on hand as well. The only thing left to do is call in your food order, and get that tray of cupcakes scheduled to pick up the day of the event. The day of the open house, everything should be accounted for, with only a few things to check in on and set up. Things do not always go as planned, but using your open house checklist you can guarantee a smooth event by making sure the details are addressed. The day of the open house is your final review and set up. Arrive early with whatever treats you may have preordered, park away from the entrance to allow for maximum guest parking, and begin your walk through the property. Be sure that the walkway is safe and easily accessible if you’ve had inclimate weather, and set the thermostat to a comfortable temperature as you start a tour correcting minor issues you might see throughout the home. Toilet seats left up or a garage door open can leave a poor impression of an otherwise solid space. Prepare the space for its best showing by setting the mood. Turn on the lights, light the fireplace, and showcase the home’s best use. Having food and beverages arranged in the kitchen, and possibly the table set can show the home as a space for entertaining yet cozy nights at home. While statistically, we know that open houses don’t always sell homes, they do provide fantastic leads for future clients. Be sure that you are in a position to greet each guest as they arrive and encourage them to sign-in at the sheet. Be a good host, initiate conversation, have your phone set to vibrate, and have your marketing materials placed prominently at the entrance. Be present and available for conversation during the open house, and consider it an opportunity to showcase not only the home for sale, but your skills as a realtor. Be sure at the end of your open house, you gather your leads and follow up on all of those who attended. Sometimes it’s easy to just put these in your CRM and set a reminder. Contactually, the CRM we highly recommend, allows you to put individuals into specific categories and set reminders to contact them. A successful open house for realtors is one that spans far beyond the listing you showcase. Every person who walks through the door of an open house is a potential new business lead, assessing the work that you’ve done. By reviewing the steps on how to host an open house, and using an open house checklist for the details, you can create an event that demonstrates your skills and professionalism. While it may not sell the property immediately, the long-term impact of doing a solid job hosting an open house could mean more buzz your listings, establishing your ability to market properties you represent and gaining more clients for future work. Using an open house checklist can help you nail down the details for a repeated pattern of professionalism – feel free to add items that customize it to you! Julie Gurner is a staff writer at Fit Small Business, specializing in Real Estate. As a doctor of psychology who also took the real estate agent course, she has renovated and flipped properties in multiple states. Julie has been featured in The Huffington Post, and her answers on Quora have received over 7 million views. Her interests include restoring old homes, keeping fit, and real estate investing. She lives in Lancaster, PA with her wife, rescue dog, and curious cat.